What gets you out of bed in the morning? For some people, it’s the career they’ve dedicated their lives to. For others, it’s raising kids and building a family. But, what happens when the kids have all grown up and moved out or after you’ve retired from that nine-to-five grind? Without a sense of purpose to keep us moving, it’s easy to feel a bit lost or aimless. Even with plenty of hobbies, friends to spend time with and family gatherings to enjoy, it’s common to feel like something is missing from your life. In this post, we’ll share ways to fill that space with things you’re passionate about while also doing something good for your community. Who knows, you might find that volunteering brings the renewed sense of purpose you’ve been craving. You may also discover other benefits of volunteering that hadn’t crossed your mind. 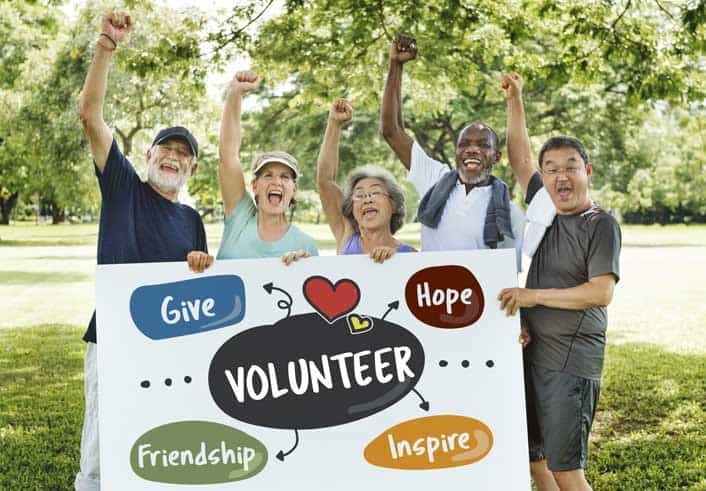 Whether you’re newly retired or have been enjoying this new phase in your life for a few years, studies show that volunteering can be especially beneficial for the retired population. According to the Mayo Clinic, the benefits of volunteering can range from reduced stress levels, a boost in self-esteem, and improved mental health, to lower blood pressure, and an overall better quality of life. So how do you get started? Look into a cause or local organization that you’re passionate about and see if there is a way you can give back. It can be a win-win, you help an organization in need and enhance your quality of life all at the same time! Here’s a closer look at three unexpected benefits you’ll enjoy when you start volunteering. Yes, it sounds too good to be true, but this benefit is well-documented. 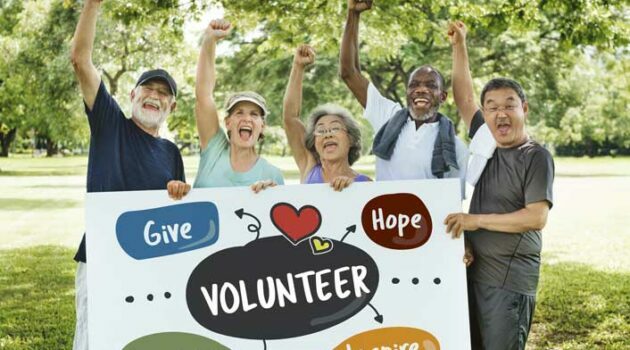 The Center for Disease Control (CDC) and its Longitudinal Studies of Aging found lower mortality rates among individuals who spent time volunteering when compared to individuals who did not engage in volunteerism. Additional studies have found that the benefits of volunteering can lead to a reduction in chronic pain and depression and can even lower your blood pressure as well. Is it possible that a charitable, giving soul can enjoy a longer more fulfilling life? Maybe. In the 60s, the Rolling Stones famously sang about not being able to get satisfaction. Too bad no one told them about this health benefit of volunteering. When we’re doing something good for humanity, the brain releases four main “feel-good” chemicals – endorphin, oxytocin, serotonin, and dopamine – that makes us feel happy and connected to something bigger than ourselves, which can be an immeasurably rewarding and fulfilling experience. The key is to find something you’re passionate about, tune into your talents, and determine how you can help advance a cause or organization that’s close to your heart. Your help will be appreciated, and you’ll free great knowing you played a role in the success. Not only can you meet new people, fine-tune your social skills and expand your network; volunteering can leave a legacy of giving that will be remembered by many for years to come. Simply sharing a volunteer experience can impact others and motivate them to also explore ways they too can make the world a better place.  At Christian Care Mesa one volunteer stated “When it came the time I felt I’d played as much golf as I could play, I know it was time to give back. And there was no question of where that would be.” Serving the senior population is a rewarding experience. Giving our time back to a generation that gave so much is a way to say thank you for all you have done. Through volunteering, we are giving our time to others. This selfless act of giving our time, we give a part of ourselves to enrich the lives of others and set an example for others to follow. We build lasting relationships with those we serve and connect ourselves with a higher purpose. The most important part is we strengthen those around us and are a part of making our life and our community a better place to live.